NEHA is pleased to announce the release of its FY2017–18 annual report, which highlights successes and milestones of the organization. 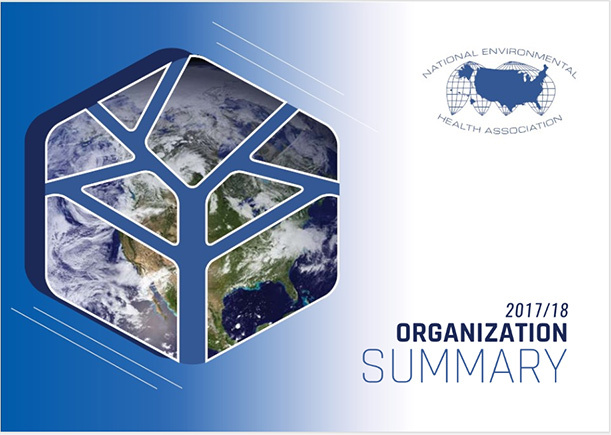 The annual report demonstrates NEHA’s commitment to becoming an essential partner and the most influential voice in environmental health. The report details the growth of the organization including membership and credentialing, advocacy efforts in Washington D.C., and the Annual Educational Conference & Exhibition. Readers will gain insight into the various aspects of NEHA such as our products, training courses, tools and resources, the Journal of Environmental Health, and financial data. Learn about what NEHA is doing to promote thought leadership and what the future holds as the organization continues to expand its outreach. Visit the Annual Report page where you can view an interactive version of the report or download a PDF.